Six months ago, Carlos Hernandez wearily watched as his teenage son left the family farm in Guatemala and set out in search of a better life in the United States – illegally. Days ticked by as Carlos idly gazed out over his four-acre corn field in the sweltering sun trying to pinpoint how he could produce enough corn for his family to be self sufficient. Today he proudly weaves through his budding cornfield, juvenile corn stalks pushing toward the sun after being replenished by a fresh rainfall. On one side of his parcel, cornstalks brush against his shoulder, but on the other they are about eight inches shorter. He turns around proudly and spreads his arms wide to show us the evident height difference of his milpa. “If we see this difference in the harvest, this could make growing corn profitable again. This could change a lot!” he says. The story of Carlos’s plot of corn is the story of the good power of nitrogen. Nitrogen is a colorless, odorless, tasteless element that forms 78 percent of the Earth’s atmosphere. It is agriculture’s engine – the key to feeding our growing hungry world. Without this essential element, the vital process of photosynthesis cannot function, no protein can form and no plant can grow. Corn, wheat and rice, the fast-growing crops on which humanity depends for survival, are among the most nitrogen-hungry of all plants. In fact, they demand more of this essential element than nature alone can provide. A modern science miracle was unleashed in 1903, when scientist Kristian Birkeland along with his business partner Sam Eyde discovered a process that could be used to fix atmospheric nitrogen into nitric acid, one of several chemical processes generally referred to as nitrogen fixation. Today, factories utilize this chemical process to produce massive quantities of nitric acid for one purpose: agriculture. Factories capture inactive nitrogen gas from the vast stores in our atmosphere and force it into chemical union with hydrogen in natural gas, creating the nutrients that plants thirst for. More than 100 million tons of fertilizers are applied worldwide each year, supplying our planet with plentiful harvests. But that’s only part of the story. At Semilla Nueva, we have a lot of interest in how fertilizers can be used responsibly and sustainably to feed our growing planet and boost farmers’ incomes in the process. Chemically synthesized fertilizer has significantly supported global population growth – it has been estimated that almost half the people on Earth are currently fed as a result of synthetic nitrogen. Without it, our population today would cease to exist. Our planet’s overworked soils simply could not grow enough food to provide all 7 billion of us with our nutritional needs. But the world is continuing to grow and our Earth is beginning to feel the toll. While nitrogen fertilizer makes food abundance possible, only half the nitrogen applied as fertilizer is harvested with crops; the rest is lost through erosion and emissions. Improper use leads to nitrogen being carried away by water in runoff contaminating lake or rivers, eroding with our soil into our oceans and suffocating our wildlife. This problem is one of the most pressing challenges to the long-term sustainability of our global food system. In developing countries, environmental costs could become much higher. The United Nations estimates that we must double food production by 2050 in order to feed an expected 9 billion people. Further, agriculture continues to be the main source of livelihood for between 50-90 percent of the population of these countries. Farmers are increasingly turning to fertilizer use to sustain the nutrients for their soils. Currently, developing countries use more than 50 million metric tons of nitrogen fertilizer annually, valued at $15 billion USD. Fertilizer use is expected to increase with projected average annual growth rates of 1.8-2.4 percent annually in Africa, Asia and Latin America. But there is a rising concern; the majority of farmers in developing countries misuse fertilizer due to lack of access to information, extension services and technical skills. Studies show that nutrient uptake by plants in developing counties may not exceed 40 percent, meaning that considerable amounts of applied fertilizer nutrients are lost to the atmosphere or our water systems. This leaves financially struggling farmers with less money and less crop production. Nitrogen is a very mischievous element, constantly moving around, making its application process essential in ensuring its absorption into the plant. If too much nitrogen is applied at one time, plants can’t absorb all of it and it escapes into the groundwater. If the nitrogen is applied on the surface of the soil, it may evaporate before it soaks into the plant. If it is applied too early, plants do not yet have roots formed to absorb the nutrients. Much of the time farmers are unaware of the composition of their soil causing them to apply too much nitrogen when their soil may be lacking phosphorous. Lack of education is preventing vital information – such as how farmers can make the most efficient and profitable use of fertilizer – from being utilized and trapping many farmers in the cycle of poverty. On the southern coast of Guatemala, a country where 72 percent of the soils are degraded, there’s a glimpse of hope. Semilla Nueva, a nonprofit organization, is partnering with Armando Tasistro from the International Plant Nutrition Institute to work with smallholder farmers to determine the proper mixture, amount and application so they can get the most bang for their buck. “In Guatemala, it is not a problem of lack of fertilizer. Fertilizers are very accessible; the problem is that they are being misused. Farmers need to work on the timing and synchronizing the nutrients with the crop growth,” explains Tasistro. For example, urea, the most popular nitrogen fertilizer used throughout Guatemala, is one of the main culprits. Tasistro has witnessed that farmers are applying urea on moist, warm soil – conditions which lead most of the nitrogen to evaporate into the air. Without their knowledge, these poor farmers’ money is blowing away in the wind. On a small plot of land on the coast of Guatemala, home to Semilla Nueva’s Experimental Center, Tasistro and Semilla Nueva field staff are searching for the answers to these questions. The parcel is marked with colorful pegs and cryptic scientific code, a testing ground. In all, there are 27 different treatments of various fertilizer mixtures, repeated three times. Together they will test what nutrients have the most potential to increase yields, and which nutrients are being over-applied. The corn in the plots shows large differences in size, health and yield, which will provide the data to make new recommendations for farmers. “People have to keep in mind you cannot change what you don’t measure. If you don’t measure anything you cannot tell if you are improving or getting worse,” explains Tasistro. However, their research is not just restricted to a scientific setting. Semilla Nueva and IPNI also began 10 tests with farmers this year. These tests are on small parcels of farmers’ land so they can see for themselves the difference in fertilizer applications. Carlos is one of those farmers. 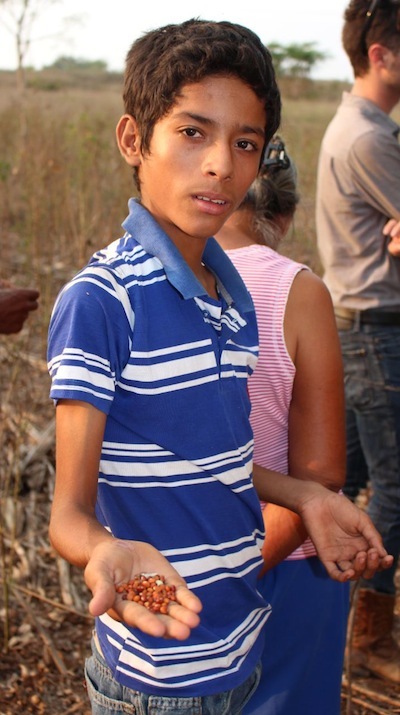 Year after year, Carlos has spent the little money he has purchasing fertilizer only to toss it over his fields. But with the guidance and education provided by Semilla Nueva he has realized that he had been applying too little, applying it the wrong way and applying it at the wrong time. So this year, Carlos tested a few changes: a bit more nitrogen, applied a bit earlier, distributed into three applications instead of two, and buried in the soil instead of thrown on top. These small changes have shown a big difference. For a very small increase of about $50 for both increased fertilizer and labor, Carlos might be able to increase his yields by as much as $200 an acre. These small changes will not only increase his income, but also lower the amount of nitrogen polluting groundwater and lost as greenhouse gases. These simple changes are creating a healthier environment and a better life for Carlos. But fertilizer is not the only option for farmers to add nitrogen in their soils. We are also working to promote an integrated approach that allows farmers to supplement their improved fertilizer applications with a more sustainable ecological approach. Green manures are crops that farmers can grow to rebuild their soils and create natural fertilizer. While synthetic nitrogen is formed in a laboratory, these plants use a symbiotic relationship with nitrogen-fixing bacteria to pull nitrogen from the air and deposit it in the soil. Our green manure of choice is pigeonpea. Pigeonpea is a legume that can be conveniently planted in between farmers’ other crops without reducing their yield. Its leaves drop to provide nitrogen, roots run deep and break up compacted soil, and the stocks can be cut down and used as firewood. Plus the pigeonpea bean itself provides nutritious, protein-rich meals. 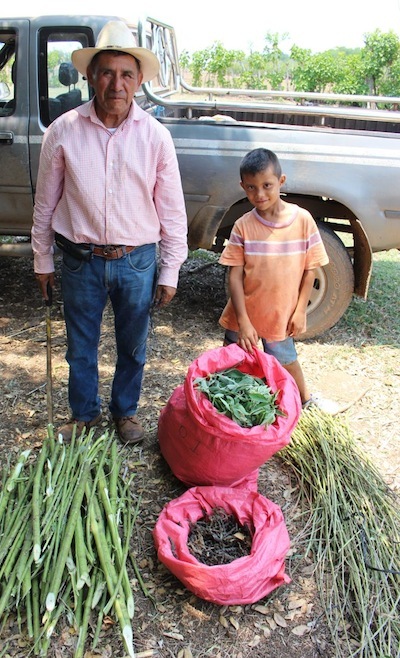 In 2013, Semilla Nueva helped more than 1,000 families plant pigeonpea and are already seeing that some families are slowly supplementing their traditional black bean consumption with pigeonpea because it is more affordable and accessible, while helping their soils get healthier. Pigeonpea doesn’t provide enough nitrogen to meet the needs of the next corn crop, but it does reduce the amount of chemical nitrogen needed, both by fixing nitrogen directy and improving soil quality. While it may take time, there are steps being made to use fertilizers more efficiently and effectively. According to Tasistro, “If farmers use what they need, in the amount they need, and use it properly, there will be less poverty and less waste.” Farmers will save money and protect the environment. So as our Earth becomes increasingly crowded and food security becomes a pressing issue, the limitless supply of nitrogen, agriculture’s most essential element, made possible a century ago by chemist Fritz Haber, may not be the ultimate panacea to food abundance. The innovative solution that will save our planet this time doesn’t come from simply making more nitrogen in a laboratory. It comes from farmers and their fields, from governments and their farmer education programs. Although these challenges are daunting, we know that taking them on is one of our species’ best chances to reduce poverty, create global food security and protect the environment. Lee Stroman is the communications and outreach coordinator for Semilla Nueva. To learn more Semilla Nueva’s work, visit their website at www.semillanueva.org, follow them on Facebook and Twitter.